← The Dentist is Here! Here is poor TahNahWit. He is a very sad 12 year old boy from GeGhah village. We were called late at night last week by the school workers and teachers, to please come and check a boy who had a bad injury to his leg. Not knowing where or how it had happened we flashlighted our way to the school and waited to be shown the way to this boy. Come to find out he had wrecked a motorbike out in the rice garden behind the school and we must walk back there and check him. 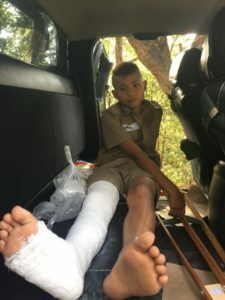 Yes, as BletJhaw and I examined the boy, and I was sure that right leg, (tibia) was broken, but did not seem to be displaced at all. He was in a lot of pain, but seemed to be sad as well. I told the teachers that he didn’t need to go to the hospital that night, but should receive an x-ray in the morning. He was carried to the school on a blanket tied to 2 wooden sticks. The Father had arrived at this point and we asked him to decide if he wanted hospital treatment or not. We knew from past experience that if he decided to do it the devil way he would tear off the cast, so we made it clear that if we took him to the hospital he would have to obey the doctor and leave the cast on the entire time. The father agreed to obey, so the next morning we were off to Meta hospital. I am thankful to the dear Principal of the school and the teachers who give such loving care to their students!! As you can see the boy has a long leg cast on. It was a complete fracture of the tibia, but what bothers me so much is the doctor put that cast on with the leg straight as a board! The knee should be bent a little in a functional position. It will still heal alright if the cast is left on, the only thing is that recovery will be more difficult and it will take longer to get full range of motion.